Installation size of PUR glue machine 1680x1050x2750mm(the rising height of PUR heating disk). 1. 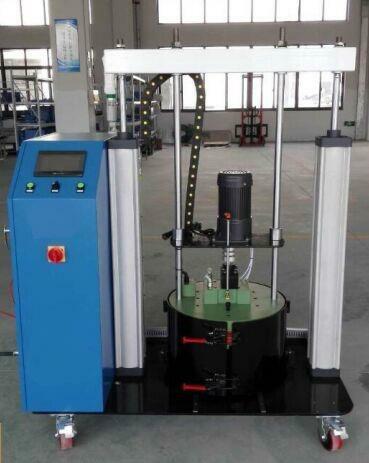 The 55 gallons humidity reaction model PUR disk type hot melt glue machine is equipped with the temperature controlling meter for the control of system temperature, which save the cost for customer. Polyurethane PUR hot melt glue machine is equipped with more sections temperature control, with the temperature control can be accurate to ± 1 ℃; The PUR hot melt glue machine has complete internal appliance and mechanical protection function, the upper limit and lower limit alarming device of polyurethane hot melt glue temperature, damage alarming of PUR hot melt glue machine, making the accurate and stable control to the operation of polyurethane hot melt glue machine. 2) The 55 gallons PUR hot melt glue machine adopts light touch button operation, it has a simple and friendly human-machine operation interface, the device can be operated without complicated training. 3)The 55 gallons barrel packing PUR polyurethane hot melt glue machine apply accurate metering pump glue; PUR hot melt glue machine is equipped with the setting of motor rotating speed curve, more sections PUR glue equipment protection, when the temperature of PUR polyurethane have not reach the setting temperature of the system, the main machine motor of the PUR polyurethane hot melt glue machine will not operate, so as to prevent the damaging of pump body and motor due to forceful operation. 4)The 55 gallon PUR hot melt glue machine is equipped with the independent pressure control system for each line choke. The PUR polyurethane hot melt glue machine adopts 2 line hot melt glue choke plastic tube output, and reserve two lines glue supply tubes, which can be expanded into four lines hot melt glue supply sites for gluing. 5)The 55 gallon PUR hot melt glue machine has the inspection function for glue barrel and glue area and alarming function; PUR hot melt glue machine has the function of intellectual malfunction positioning; the PUR hot melt glue machine spraying equipment is applicable to the melt gluing of PUR hot melt glue and the application of 55 gallon barrel PUR hot melt glue with international standard. 6) Glue position indication function of PUR disk hot melt glue machine: The 55 gallons PUR hot melt glue machine system is designed with unique glue amount reminding function through adopting the three-color glue amount indicator (green, yellow and red), with the connection with the electronic alarming system, user can know the leftover glue amount in the glue barrel in time, when the PUR hot melt glue in the barrel is used up, there is a system for special reminding. 7)The heating round disk surface of humidity reaction disk polyurethane PUR hot melt glue machine is treated with multi-layer Teflon, the melt glue disk sealing circle of PUR hot melt glue machine adopts the American Dupont perfluo rubber as the material, with the maximum high temperature resistance of 307℃, with the feature of corrosion resistant, high temperature resistant, the device can prevent the bonding of any material, easy to wash, which is applicable to the two specification barrel PUR hot melt glues of international standard, it can be applied without replacing melt glue disk. 8)The PUR reaction hot melt glue machine special gluing equipment adopt precision hot melt glue scraping gun, spraying gun, gluing gun and other modules to apply the reaction PUR polyurethane hot melt glue or common hot melt glue EVA on the products, with even glue application, control the glue application amount precisely, save the glue material and achieve the optimum effect. The product is specially applicable to the glue application on the material of large production quantity, high quality demand, touch coating operation. 9)The 55 gallon PUR hot melt glue machine adopt European designing standard, introducing the idea of international advanced polyurethane glue machine design, all the safety standard are designed base on the European standard, the safety performance is high, all this advantages making the 55 gallon PUR glue machine can be connected with many spraying and coating modules, collaborated with many equipment precisely, for meeting the glue coating demands of fast developing new process and new material. 10)The glue melt disk of polyurethane hot melt glue machine is designed by integrated module, which is easy to wash, at the same time, by equipped with the different polyurethane melt glue disk, the same PUR hot melt glue machine can apply round curve heating disk, multi hollow tube heating disk and so on. 11)The PUR hot melt glue machine has the intellectual temperature keeping sleep, when do not need to operate for long time, e.g. In noon rest, to start the temperature keeping and sleep function, it is no need to turn off the power of hot melt glue machine, so as to reduce the time of renewed heating efficiently, and save the power consumption efficiently, reduce the standby time and save power. 12)Saipu humidity reaction polyurethane PUR heat melt glue machine adopt the guide type flow valve reaction for acceleration, which increase the pump glue efficiency of polyurethane disk hot melt glue machine efficiently. 13)The 55 gallon PUR hot melt glue machine apply patent designed glue barrel automatic position aligning device, no need complicated aligning operation in replacing 55 gallon polyurethane hot melt glue barrel, simple and fast in replacing glue, the PUR glue machine is easy to remove the barrel. 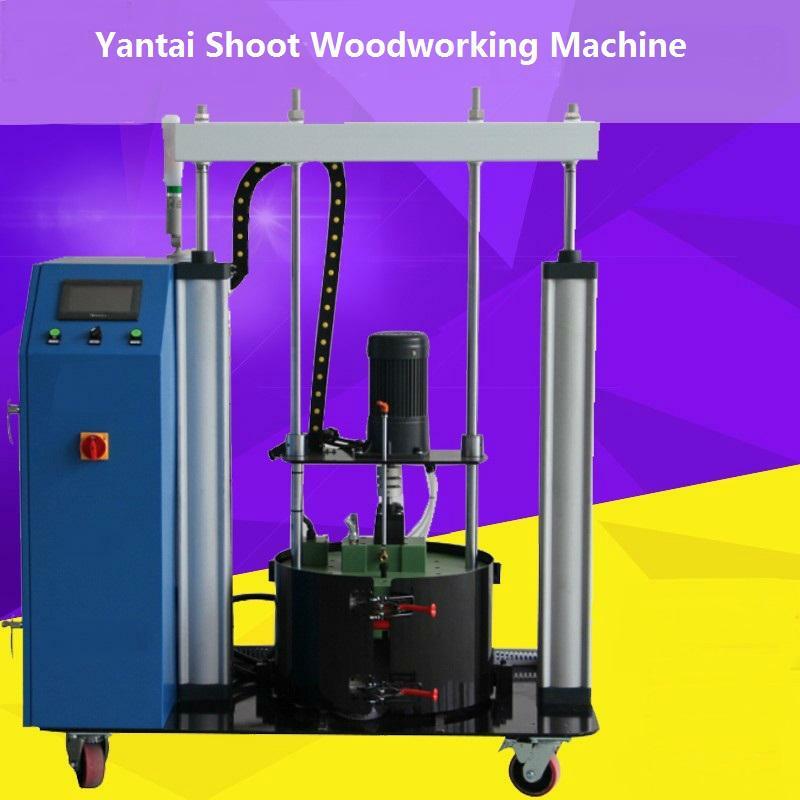 14)The 55 gallon PUR polyurethane hot melt glue machine is equipped with the rich external interface, it can connected with the robot arm for automatic gluing operation, so as to realize the collaborating control of various devices and connection with computer.